1. It’s impossible to imagine a world in which they agree on an alternative speaker, and in fact neither group seemed to prepare for the moment by having a challenger ready. 2. They are both small groups, and the liberals—who support Pelosi—are large. Both of these obstacles are basically insurmountable. Let’s start with the first. The centrist right group includes several new representatives who flipped Republican seats in the midterms, and many of them vowed not to support Pelosi—a vow that probably helped them win in purple-to-red districts. The idea that they’d support someone from the progressive left instead—someone like Alexandria Ocasio-Cortez—is just silly. She would be considered worse than Pelosi, and the 17 reps who signed a letter vowing not to vote for her would never go for it. Which brings us to the second problem—size. Power comes in numbers, and though Pelosi’s claims that she has the votes probably doesn’t stand up to the math right now, she certainly has far more votes than anyone else. Which leaves the left and right—but mostly the right—with only one option, which is to essentially hijack the vote. Here’s how that would work: Pelosi needs 218 votes to secure the speaker’s gavel—one more than half of the entire House body—and with no Republicans supporting her, that means the breakaway Democrats could withhold votes and keep her from a majority. Their numbers may be small, but they do have what it takes to obstruct—the 17 who signed the anti-Pelosi letter would be enough on their own even without the progressive left. But then what? What comes next? Do they really expect the massive liberal body to eventually support someone from their ranks, or to back down from their loyalty to Pelosi? That’s not happening, because it would be a capitulation to a much smaller force. And while mainstream liberals seem to have excelled at capitulation in recent years, even they won’t back down from this fight. Which means an obstructed vote would lead to a long stalemate in which the obstructionists would be painted as holding up the democratic process. They could continue to stand alone, in which case a new roll call vote would be called. The last time that happened was 1923, and it took nine ballots to choose a speaker. If that happened this year, Pelosi’s supporters would accuse the renegades of hurting party unity at a time when they should be opposing Trump in one voice, and they’d throw out a few accusations of sexism too. The pressure would mount, and they’d eventually lose anyway. The only difference between that and not fighting at all is that they’d have to eat crow in the most public manner possible. The truth is, the outlying groups can’t win. They have power insofar as the liberals need them for a majority, but that power is only magnified to Pelosi-killing levels if they can credibly threaten to turn Republican if they don’t get their way. Since they can’t do that, their hands are tied. The progressive left is taking the smart tactic at the moment by remaining quiet and letting the process play out—they have popular momentum within the country, and it would be foolish to spend that credit on a losing battle at a time when they should be consolidating their gains and aiming for more. If the centrist right continues to play hardball and even hijacks the vote, they’ll not only earn the ire of the party and its constituents—they’ll expose their own weakness. 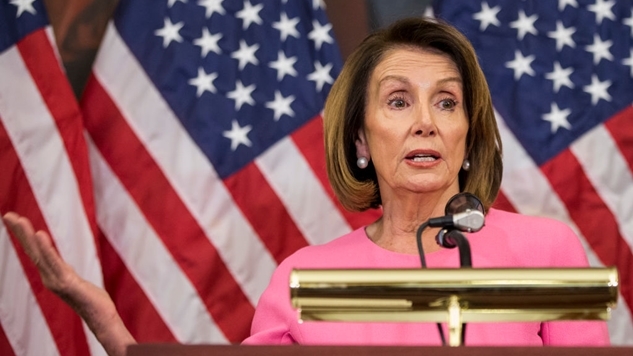 There are worse problems than having Pelosi in the speaker role, and the way to claw power away from the liberal establishment is by exerting pressure constantly in matters of policy and influence, as the progressives have done, and rallying the people to your side in the process. Fighting the battle to dethrone her, on the other hand, is not just pointless—it’s impossible. Even a symbolic victory is beyond the grasp for the conservative Democrats, and this is not the time for noble losses.